Fifteen Palestinians were injured with live and rubber-coated steel bullets while tens of others suffered from severe tear gas inhalation during clashes with Israeli forces that erupted before dawn on Wednesday in the village of Kobar, northeast of Ramallah in the central occupied West Bank. Israeli forces raided Kobar and closed the two main entrances to the village with dirt mounds and rocks, and installed flying checkpoints, preventing Palestinians from leaving or entering the village, according to locals. Clashes erupted between Israeli forces and Palestinian youth who attempted to prevent Israeli soldiers from raiding the house of Palestinian prisoner Omar al-Abed, 19, who was detained last month after he stabbed and killed three Israeli settlers from the nearby illegal Halamish settlement. Locals told Ma’an that Israeli forces “assaulted the youths,” raided and ransacked al-Abed’s house, damaged the furniture, and detained the teenager’s father and uncle. Witnesses added that Israeli forces heavily fired live ammunition, rubber-coated steel bullets, sound bombs and tear gas at youths who threw rocks at soldiers. Palestinian Red Crescent ambulances transferred the injured Palestinian youths to Ramallah-area hospitals through a road of the neighboring village of Burham. During the clashes, Israeli forces detained three Palestinians, identified by locals as Yasser al-Abed, Basil al-Fahed, and Muhannad Shalash. 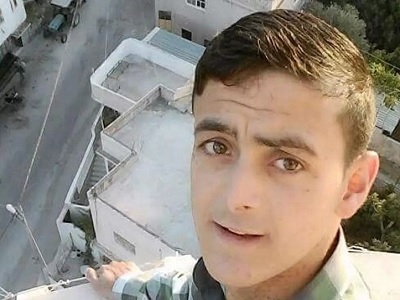 In the wake of the Halamish stabbing, Israeli forces imposed a series of punitive measures on the family of the attacker, 19-year-old Omar al-Abed, and the residents of Kobar, temporarily sealing the village, detaining the al-Abed’s brother and mother, and raiding the local health clinic.